Temporary lane closure. The number and position of arrows and red bars may be varied according to lanes open and closed. # 2: What does this sign mean? 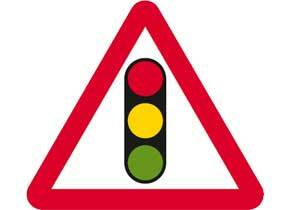 # 3: Which sign tells you there is a quayside or river bank ahead? 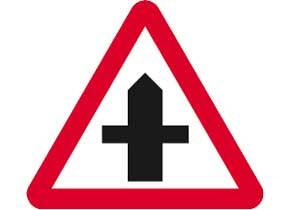 # 4: This sign is placed at which type of crossing? The sign is used only at Zebra crossings. 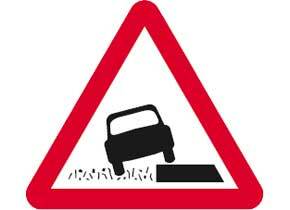 The slippery road sign is intended for use where the danger of vehicles skidding is greater than normal. Be extra careful when the road is wet. Reduce speed. Avoid quick stops, and side movements. # 6: What does the broader line on this sign mark? The priority through the junction is indicated by the broader line. # 7: Which sign tells you to be alert for strong winds? # 8: What does this sign mean? Road narrows on left side. 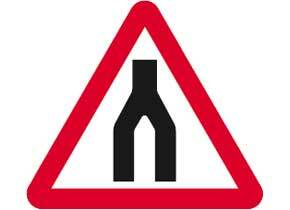 Road narrows signs give warning that the existing carriageway width becomes restricted. Signs may supplemented by a single traffic fileplate. 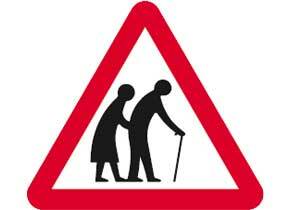 # 10: What does this traffic sign mean? # 11: What does this sign mean? 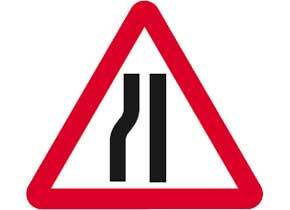 # 12: What does this traffic sign mark? # 13: What should you expect ahead when you see this sign? 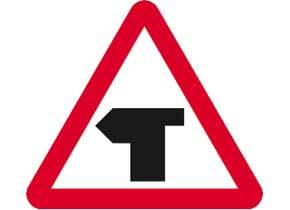 The two-way traffic sign indicate the resumption of two-way traffic on a single carriageway road after a one-way road. # 15: What does this sign mean? Traffic merges ahead onto main carriageway. 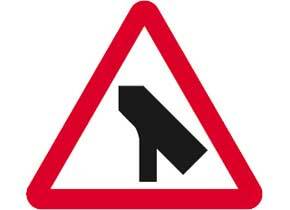 The sign is used is used to warn drivers that they are about to join a main carriageway and may have to concede priority. # 16: Which sign may be placed where pedestrians are likely to be crossing a high-speed road where there is no formal crossing point? 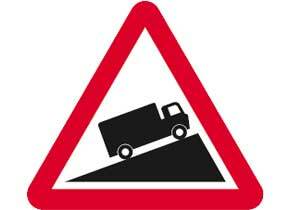 # 17: Which sign tells you there is a steep hill downwards ahead? 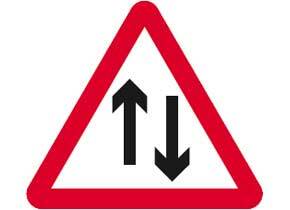 # 18: Which sign tells you that you should expect merging traffic from the left? # 19: What does this sign mean? You must turn left or right ahead. Slow down and be prepared to stop and give way. # 20: What does this sign mean? Double bend first to the left. 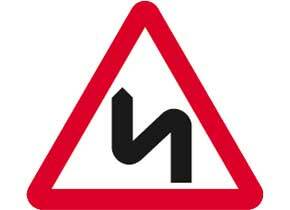 The sign is used where bends of similar severity follow in close proximity. If you study for your DVSA exam, you should try to get most of these signs right! Try again? 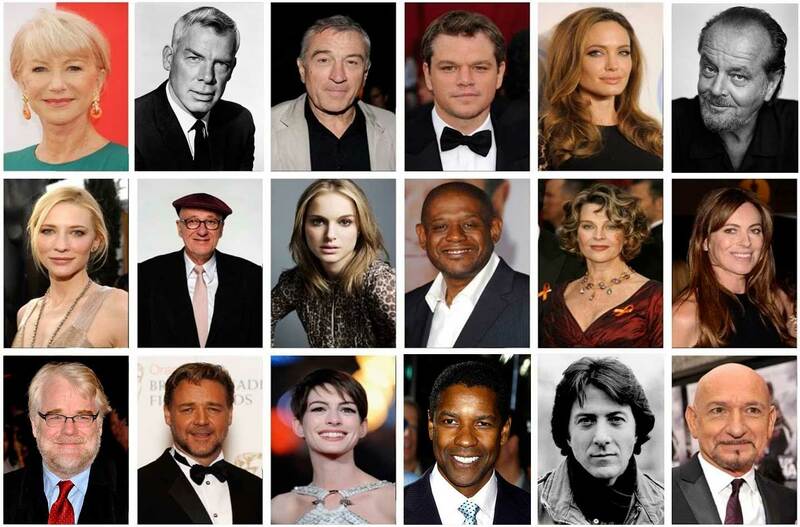 Take the Warning Signs Test! This test with common British warning signs may tell you if you are ready to take on the real DVSA examination or not. Signs are from the official publication “Know Your Traffic Signs” available at highwaycodeuk.co.uk Before you attempt the real test, make sure you can get at least 90% of these warning signs right. This quick cheat sheet with common traffic signs can also help you study for your driving licence exam. Full tests with challenging practice questions are available at Driver’s Mock Test.